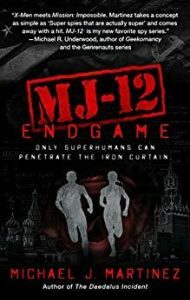 Please help us congratulate Michael J. Martinez on today’s release of MAJESTIC 12: ENDGAME! This is the last book in Michael’s intense Majestic 12 series of historical paranormal thrillers. We originally pitched the series as James Bond meets X-Men and readers agree! Josef Stalin is dead. In the aftermath, the Soviet Union is thrown into crisis, giving former secret police chief Laverentiy Beria exactly the opening he needs. Beria’s plan is to secretly place his country’s Variants?ordinary people mysteriously embued with strange, superhuman powers?into the very highest levels of leadership, where he can use them to stage a government coup and seize control of the USSR. America’s response comes from its intelligence communities, including the American Variants recruited for the top-secret MAJESTIC-12 program, who are suddenly thrown into their most dangerous and important assignment yet. From the halls of the Kremlin to the battlefields of Korea, superpowered covert agents face off to determine the future of the planet?a future their very existence may ultimately threaten. ← Winner of a Hugo and the Campbell Award!